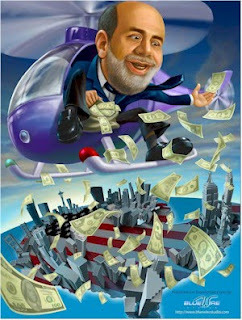 The Urban Politico: Bernanke Here To Stay!!! Despite controversy surrounding his reign, lobbying efforts by the administration and criticism from wall street and some Democrats, Fed Chairman Ben Bernanke was confirmed to a second term. Bernanke has been praised as helping to keep this country's economy from completely tanking at the end of 2008. He is credited with saving the country from reaching a second great depression and was also said to have been the first Fed Chairman, to help to make the Federal Reserve Bank more transparent and less of a mystery to the American Public. Bernanke has been criticized though, for not using his powers to help create more jobs, which is indefinitely wiin his realm of control and for frankly, being appointed to his position originally by George W. Bush. For some reason this man intrigues me. Probably because he controls an aspect of government that I have never been able to fully understand. He was a expert on the Great Depression and the events that caused the historical, economic disaster. Math and economics are not my strong point, but when I listen to this guy speak, or read interviews, I am intrigued when I here him break down his strategies and what he has done, despite not understanding most of what I am hearing/reading. Essentially what I know he was able to do, was adopt a method of aggressive action, due in part to the overall mantra of the Obama Administration and his sense of urgency regarding the dire state that this country was in. I am interested in hearing how you guys feel about Bernanke being given a second term, despite criticism by Democrats and his slothfulness in job creation!